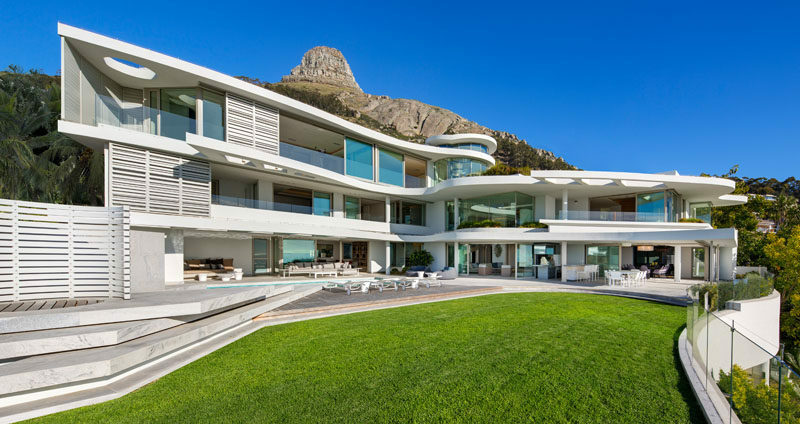 This two-storey house in Cape Town, South Africa, was originally designed by SAOTA a decade ago, but when it was bought by its new owners, they reached out to interior design firm ARRCC to renovate the home. 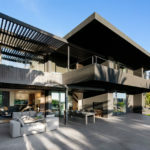 The home has a swimming pool that’s surrounded by a deck with plenty of space for relaxing in the sun, and a large grassy terrace allows for uninterrupted views of the ocean. Inside, there’s a living room with a double height ceiling. 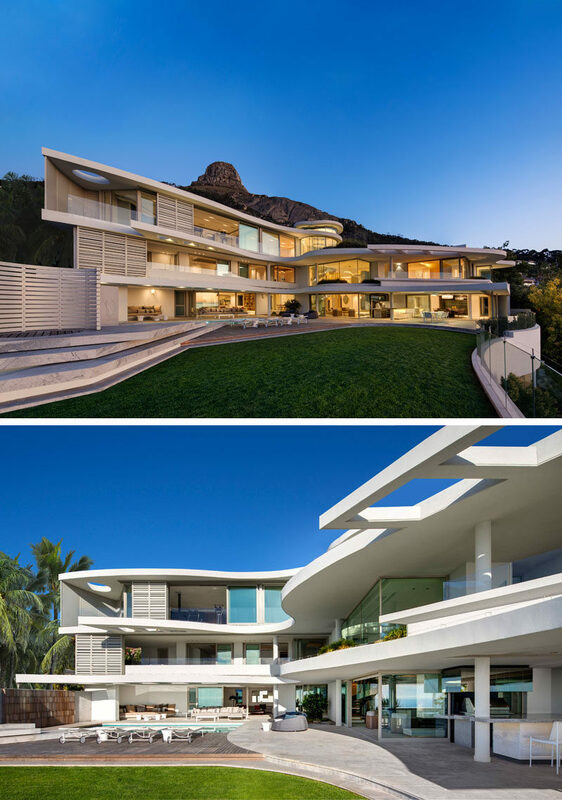 Throughout the interior, white marble, granite, brushed stainless steel and bronze elements have been included to contrast the white walls that are ever present throughout the house. 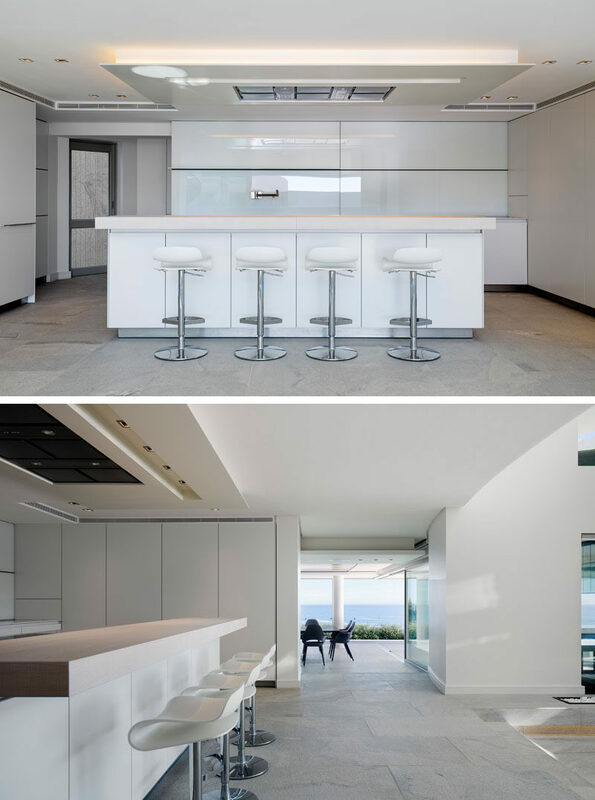 Behind the living room is a minimalist kitchen that has a light, neutral palette with white walls and cabinets, and grey floors. An informal lounge has sliding glass doors that open to the pool deck and a BBQ area. A decorative ceiling detail draws your eye upward, making the room feel taller. 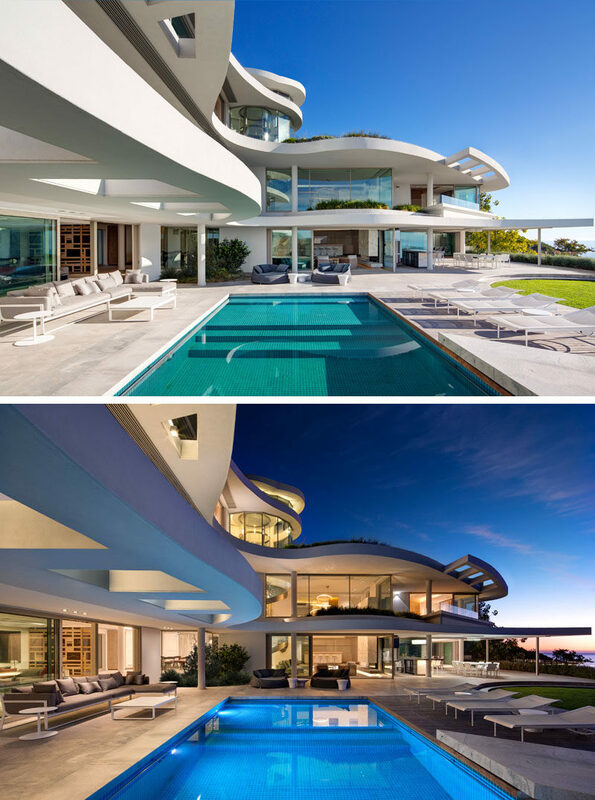 The home also has a coffee lounge with a futuristic design approach. Mercury ceiling lights by Artemide are positioned above Platner arm chairs by Knoll. In the formal dining room, there’s sliding glass walls that open up to the outdoors, and inside, there’s a walk-in wine cellar. 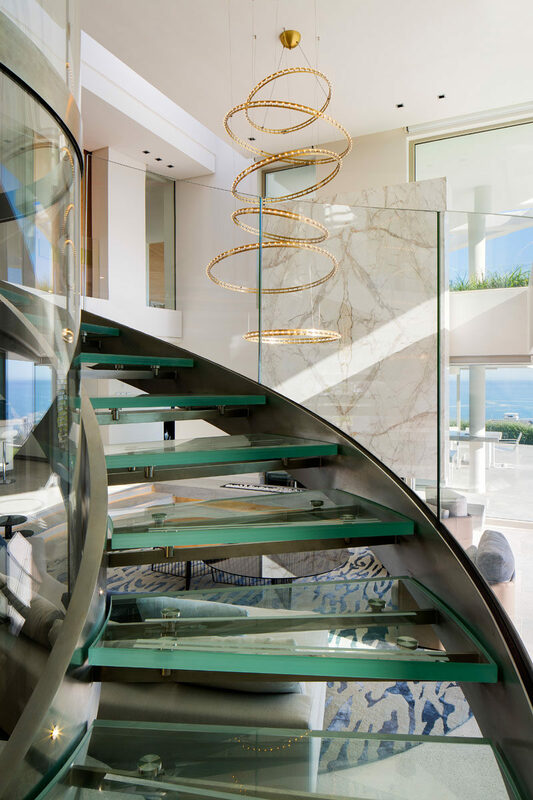 To reach the upper floors of the home, there’s a triple volume glass lift that’s surrounded by a circular glass and steel staircase. An LED metal pendant light fitting by Quasar Citadel compliments the staircase perfectly with its circular cascade design. In the master bedroom, timber paneling wraps from behind the bed and up onto the ceiling, while the bedroom opens up to a private terrace with expansive views. The master en-suite bathroom has been designed to strategically place a built-in bath tub that projects forward and allows 180 degree views over the ocean. 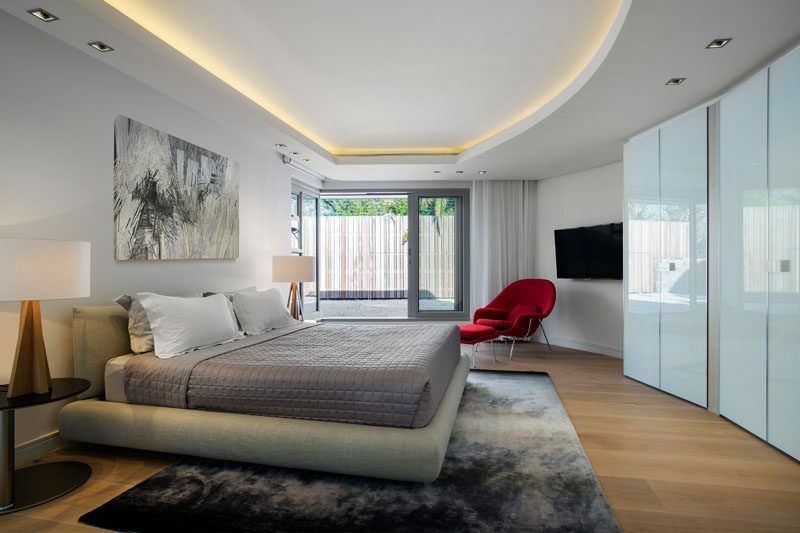 In another bedroom, hidden lighting highlights the curved outline of the recessed ceiling. 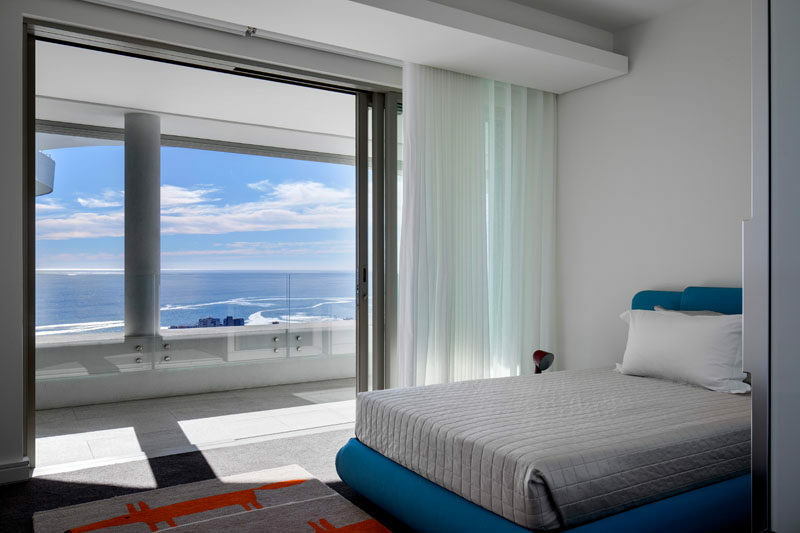 In this bedroom, a pop of color has been added with a blue bed frame and colorful rug. 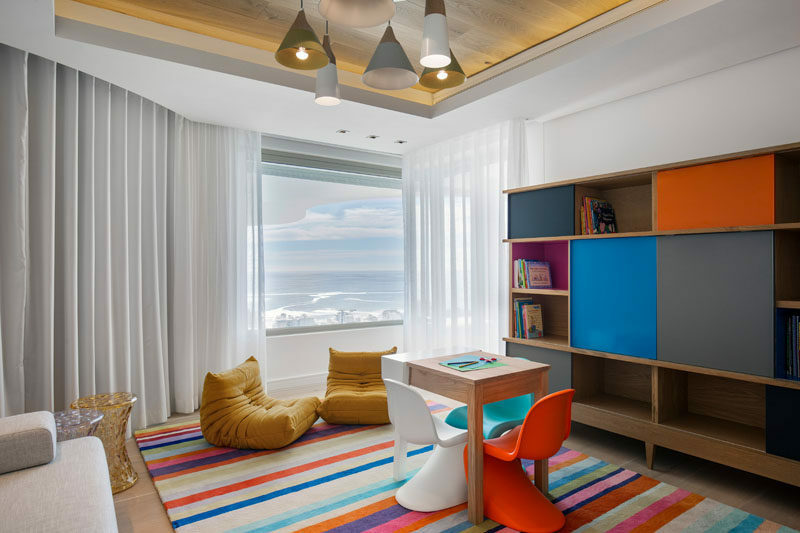 There’s also a kid’s playroom with another recessed ceiling. 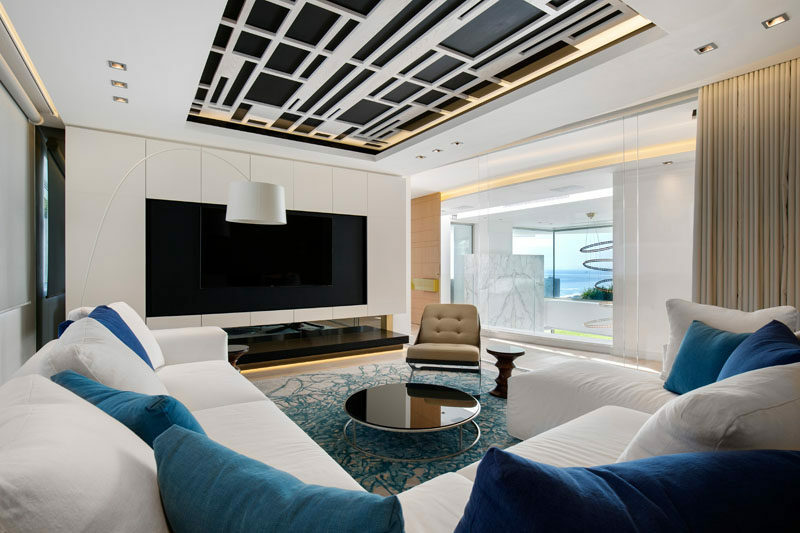 This time, the recessed ceiling is highlighted by the use of wood. On the same floor of the home as the bedrooms, there’s an informal pajama lounge set up for watching movies and relaxing. 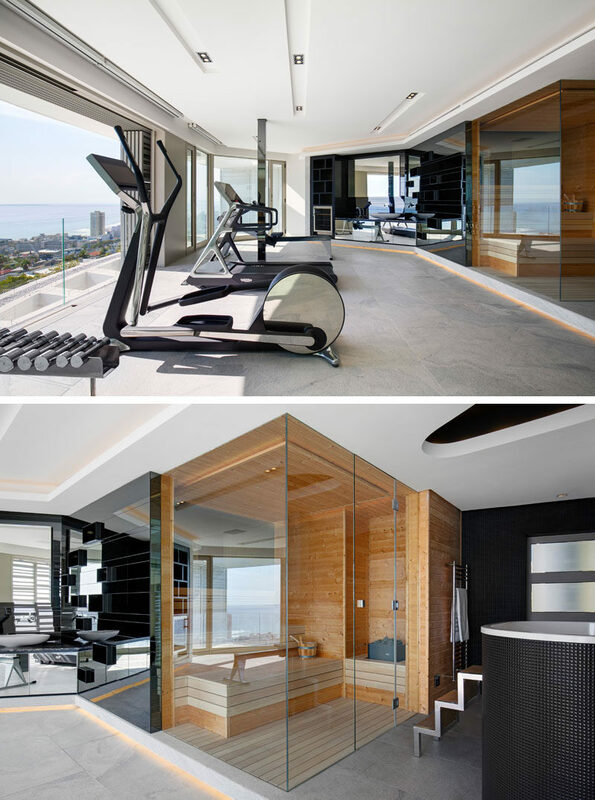 As part of the renovation, a third floor was added to the existing structure, and it includes a home office with views of the skyline and gym next door. In the gym, there’s a spa bathroom with a sauna and chiller bath. Mirrors above a vanity reflect the view outside.